Geezer Skier: Geezers Do Toggenburg - Again! Toggenburg Ski Resort provides a welcome change of pace from our home ski area of Greek Peak. Today was no exception. 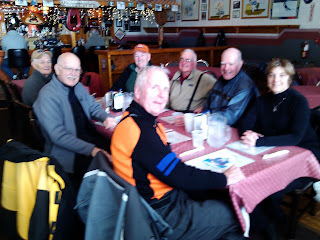 Seven of us were in attendance of a morning of skiing a different slope. Six were officially geezers, since Larry's friend Ruth in no way was allowed to qualify for that esteemed title. Perhaps she could lay claim to GIT - Geezer In Training. The grooming was sufficient to provide a relatively smooth surface that allowed some bite for the skis. A trip through the terrain park was an adventure of avoiding the massive jumps and whoop-de-doos! The visibility for these tired old eyes could have been better, but we all were able to avoid the terrain surprises. Conversation was jolly and the coffee break was extended. By noon were in the mood for the great food at the Foggy Goggle restaurant. As more than a side note, our group was warmly welcomed by all the staff of Toggenburg including the two old time ski patrollers Tom and Walt. They even remembered our visit of last year. Toggenburg is truly a welcoming place for the geezer crowd. During our morning there, I doubt whether there was more than a handful of other than geezer skiers paying the price of admission. Our lunch was pleasantly served and delicious for any item chosen. Portions are generous as well. This couldn't have been a better second day of return to the slope for me. Good friends, good food, and good skiing!! What more could one ask for. Of course the bonus for me is to return home to the warm welcome of my most loving and supportive wife Nancy.